Outside linebacker and punter Richard Pattison was also named UAA’s Special Teams Athlete of the Week. As the Carnegie Mellon Tartans football team looks to maintain their longstanding streak of winning seasons, they are getting some profitable help from outside linebacker and punter Richard Pattison in securing their victories. Last season, Pattison was named to the University Athletic Association Special Teams First Team, as well as being selected as Academic All-District. Recently named the UAA’s Special Teams Athlete of the Week, Pattison consistently performs to get the Tartans in good position to end up on the left side of the final score. A junior from Rocky River, Ohio, Pattison has been playing football since the fifth grade. 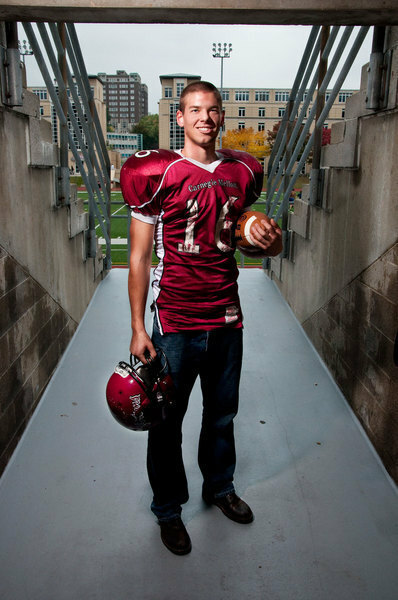 Although he has played basketball his entire life and considered playing in college, Pattison took his inspiration from his favorite professional team, the Cleveland Browns, and joined the Carnegie Mellon squad. Pattison is able to perpetuate his first love of basketball by playing for his fraternity, Beta Theta Pi, in the intramural league and in pickup games during the football off-season. When he’s not studying, honing his football skills, or waiting for the chance for a comeback from the Beta LeBrons’ second place finish last year in intramurals, Pattison enjoys watching comedy movies with friends to laugh away some of the stress of a busy college schedule. Pattison is also becoming a member of Tau Beta Pi, which is the national honors engineering fraternity. As a chemical engineering major, Pattison cites that being a Carnegie Mellon student athlete makes him wish there were more time in a day to balance academics and athletics. When all of his hard work pays off, Pattison notes that he would like to repay his parents for their continuous support even while he is currently away from home to attend school and focus on football. Until then, Pattison can take pride in his achievements on and off the football field and enjoy the friendships he values with his classmates, fraternity brothers, and teammates, while keeping the goal of another winning season for the Tartans in the forefront.